Glorious revolution – or a sordid little stitch-up? On November 5, 1688, William of Orange, landed in Devon with 15,000 armed men. James Stuart, King of England, Scotland and Ireland, mustered his own army to meet the Dutch invaders. But, instead of fighting the foe, large numbers of the English officer corps defected to the Dutch. The English Army disintegrated. James fled into exile in France and William and his English wife Mary (pictured below) were crowned joint monarchs. This was the “Glorious Revolution” of 1688 – and it is the subject of my novel Blood’s Revolution. But was it really a revolution, I ask myself, or just a coup by a foreign prince with the connivance of the Establishment? The problem was James’s religion. He was a Catholic and that was a serious political issue for his subjects. Since the days of Henry VIII, religion had divided the British Isles with successive monarchs wrangling over the inhabitants’ immortal souls. Bloody Mary burnt hundred of Protestants at the stake for their faith; Elizabeth I was plagued by dozens of Catholic plots. But by the latter part of the 17th century England, at least, was a largely (90%) Protestant country, and Catholics were viewed with suspicion and sometimes outright loathing. There were new laws that made Catholic forms of worship illegal unless a special dispensation was granted by the Crown. Catholics (and dissenting Protestants) were barred from serving in any of the machinery of government. They could not be judges or Justices of the Peace, they could not teach at universities, they could not be MPs or ministers, or Army and Navy officers; they could not, in fact, hold any official positions at all. 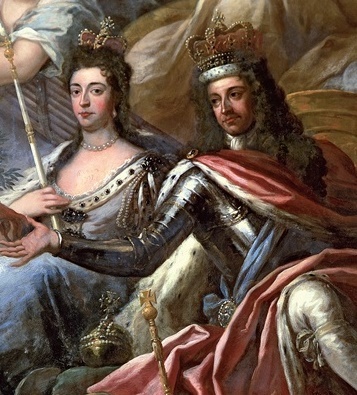 James Stuart’s royal family had mostly been Catholics, either secretly like his elder brother Charles II, or openly like his wife and his mother. When he came to the throne in 1685, James was determined to give Catholics more freedom. He wanted to lift the statutes that penalised Catholics and dissenting Protestants and allow them equality under law with members of the Church of England. He set about doing this by trying to persuade the Establishment to change the law. But he faced almost universal resistance to his plans. The university dons opposed him and resented having Catholics appointed to senior roles in their colleges. While Parliament was in abeyance, James met and tried to cajole hundreds of prospective MPs into supporting his repeal of the anti-Catholic laws – most refused. 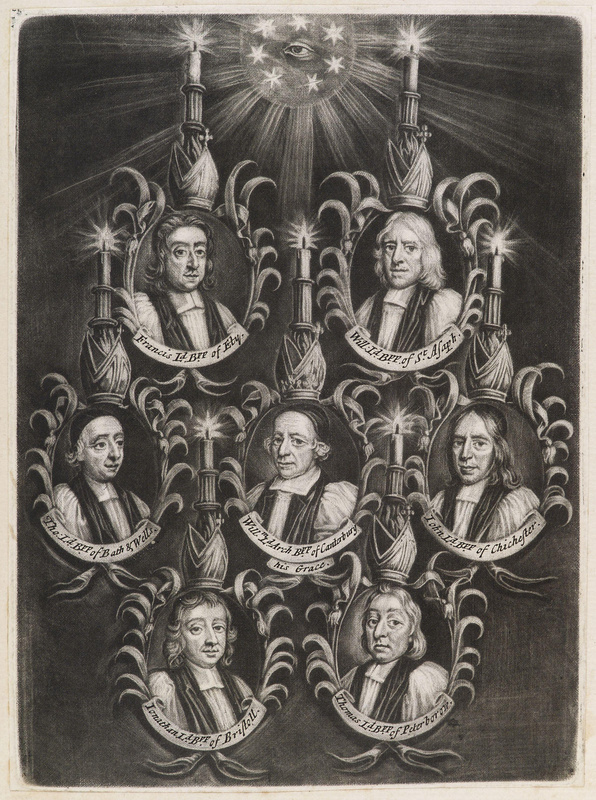 Seven senior bishops of the Church of England (see below) declined to read out a proclamation in every pulpit in every church the land that granted freedom of worship to Catholics and were duly sent to the Tower of London. In Ireland, Protestant Army officers were dismissed wholesale – some losing money they had paid for their commissions – and replaced by Catholic men. Most people were outraged by James’s actions. His popularity plummeted. James was, without a doubt, a difficult man to deal with, autocratic and tactless, who believed that as King it was his right to rule as he pleased. But the civil wars that destroyed his father, the first King Charles, had changed that model of governance for ever in Great Britain. The rule of autocratic kings who governed by their Divine Right could no longer tolerated. For the British people, Parliament was sovereign. And the laws of the land were made by this gathering of (wealthy Protestant) representatives of the folk who were to be governed. James’s attempt to change the anti-Catholic laws by decree was a step too far. Despite all this, most of James’s subjects were initially prepared to do nothing and leave James be. After all, he had no legitimate male children, the wiser ones pointed out, and when he died the throne would pass to this eldest daughter, Mary, who was a staunch Protestant. No king lives for ever. All this changed, however, when in June 1688 his Italian wife Mary of Modena gave birth to a son – James Francis Edward Stuart, who would in future be known as the Old Pretender, and who would also be the father of Bonnie Prince Charlie. This birth changed everything. The boy, now the heir to the thrones of the Three Kingdoms, would certainly be raised as a good Catholic and Britain was looking at the prospect of a Catholic dynasty. The horror! It is difficult for us in the 21st century to imagine how terrible this prospect looked. But to the man in the street in England in June 1688 it was genuinely frightening. The British were proud of their Parliamentary system of government and thought of it as a mark of freedom. Few other countries enjoyed such political liberty. Across the Channel, Louis XIV had taken his country on another path. He was busy concentrating all power in his own hands. Louis was a genuine dictator, appointed by a Catholic God to rule France as he saw fit, and most people in Britain did not wish to be governed in this way. Catholicism, for many British Protestants, meant absolute rule by a brutal tyrant. So they acted. The Army and Navy met in secret little cabals, in clubs and restaurants they plotted the betrayals they would enact if William invaded. The grand Protestant noblemen looked at their options and decided that they would actually invite William of Orange to come and take over the country. They wrote him a formal letter expressing their support of his coup and signed by seven leading grandees. On the surface this seems an extraordinary thing to do – to invite a Dutch prince to come over, push out the incumbent and become King of England. But while unusual it isn’t that outlandish. William was both the nephew of James II and his son-in-law. He was married to Mary, who had been the heir to the thrones of the Three Kingdoms before the birth of James Francis Edward. He had a pretty good claim to the thrones in his own right (his grandfather was Charles I) and through his wife. But I still feel that James was treated very badly. And I hope that comes through in the pages of Blood’s Revolution, which comes out on October 18, 2018, in hardback. You can buy a copy here. James wanted toleration for his co-religionists. He wasn’t trying to become another Sun King; he did not seek absolute power; he was merely trying to introduce more tolerance in Anglican Britain for Catholics and other dissenting groups such as Quakers and Baptists, etc. And he was stabbed in the back by his own subjects, by his Army officers who had sworn an oath of personal loyalty to him, and by the noblemen and great landowners, many of whom had been made rich by him or his family. While these men might have had their reasons, they did without a doubt betray him and they facilitated the outright coup d’état that brought the Protestant monarchs William and Mary to power. Today we prize tolerance highly. But it was a genuine attempt to foster religious tolerance in the Three Kingdoms that brought about James’s downfall in the so-called Glorious Revolution. Superb, Angus. We seem to be covering the same ground but from different angles. I’m just finishing writing a trilogy about the life of Catherine Yale – wife of nabob philanthropist (and slave trader) Elihu Yale. The end of the first novel and beginning of the second, sees them viewing the “Glorious Revolution” from faraway Madras and the East India Company outpost at Fort St. George. Catherine’s from a long Dissenter background and, while she’s superficially attracted by the idea of more tolerance for those who share her beliefs, her frenzied animosity towards the Catholic Church – and the examples of what had happened in France in not too dissimilar circumstances – convince her that James’s “genuine attempt to foster religious tolerance in the Three Kingdoms” can only be skin-deep and that, if the Papists ever fully regain control, that veneer of tolerance will disappear again very quickly – that she and folk like her will be the first to face the Inquisition. For me it was interesting to see the way this played out in people’s minds – even when they were half-way round the world. Looking forward to “Blood’s Revolution” though! Good luck with it. How interesting! I found it very difficult when I was writing Blood’s Revolution (and to a lesser extent Blood’s Game) to get into the anti-Catholic mindset. As an atheist, all religions seem to me to be equally ludicrous. But I got there by thinking about the totalitarian nature of France under Louis XIV, the persecution of the Huguenots, police spies, and all that. I channeled how we might feel about the threat of another Hitler. Anyway, good luck with your series! The East India Company perspective sounds like a refreshingly original take on the period. Ah, here were the things that helped me with the anti-Catholic mindset too (also as an atheist). First, growing up in Liverpool in the 50s and 60s within a fairly liberal-minded family – but one in which a Catholic was never allowed across the threshold! And, second, the India background to the story – the permanent ravages of religious wars in the 1680s between Hindu and Muslim plus, of course, within the Muslims themselves, between Sunni and Shia. There’s a short section in which the two main female characters, one Indian, one English, try to respectively explain the animosities between Catholic and Protestant on the one hand, Sunni and Shia on the other – and of course it doesn’t quite work. Blood makes a brief appearance in the first novel, of course, but only in a “news from home” context. I’m enjoying these bite size bits of history and the context they give to your books. Many thanks!